Green Express couriers is spending a lot of time back and forth from attorneys offices to the various courthouses in metro Atlanta. Attorney clients love the great service. If you want a quick delivery, call Green Express. Green Express can have legal documents taken to Federal Superior Court in Atlanta, or Fulton, Dekalb, Cobb, Forsyth counties. If you have an additional courthouse, just call our office. We are the Atlanta courier connection. If your law firm needs a reliable courier for court house filings, call Green Express; Atlanta's Only Eco-friendly courier. Call 770-394-3131. x1. Thank goodness we have another beautiful day for Earth Day in Atlanta. Green Express celebrates the day and the fact that Green Express is Atlanta's Only Eco-friendly courier. We appreciate all the companies that support our eco-friendly couriers. We are participating in events all around the city to educate people about reducing emissions, recycling, reducing fuel consumption. Our main booth is at Blue Cross Blue Shield in Buckhead where we have postcards printed on eco-friendly paper, and information about Atlanta's Green friendly courier. There are Earth Day activities going on all around the city which we have listed on previous blogs. If you need a quick delivery today, call Green Express at 770-394-3131. Tell your friends to go green the next time they need a courier. Atlanta was recently ranked #9 by the EPA for cities with energy efficient buildings. Green Express couriers celebrates Atlanta's progress in building efficiency. Green Express has made our eco-friendly courier services available to the most energy efficient commercial buildings in Atlanta. Green Express uses less fuel, emits less toxins than other courier delivery companies in Atlanta. This ranking shows the tremendous progress that Atlanta and cities across the country have made to make America’s buildings more energy efficient. By retrofitting homes, commercial buildings, and industrial facilities, American cities are significantly reducing global warming pollution, putting people to work in clean energy jobs, and saving families and businesses money on energy costs. America’s buildings use forty percent of our energy, representing ten percent of the world’s energy consumption. The good news is we currently have the technology, the know-how and a workforce that is ready to retrofit our homes and commercial buildings to make them more efficient, while dramatically reducing pollution. However, home and business owners need incentives and financing mechanisms that will make it feasible to invest in making their buildings more energy efficient and to reap the tremendous benefits for our economy and our environment. Every billion dollars of public spending on energy efficiency can leverage $2-3 billion in private investment and create 25,000 jobs in 2010. For a quick delivery, call Green Express couriers. To set up an account with Green Express couriers, click on this link. or call 770-394-3131. Green Express Couriers has recently been getting a number of calls from Intown Express courier customers in Atlanta needing service. Green Express is accepting previous clients of Intown Express delivery and is allowing customers to pay by credit card for their first run. If you were a client of Intown Express courier 342 Marietta Street in Atlanta, GA 30313, you are welcome to use GREEN Express courier for package delivery in Metro Atlanta. Green Express provides rush, same day service, next day service in Metro Atlanta. If you want a quick delivery in Atlanta, call Green Express! Go GREEN! for Atlanta courier service! Atlanta’s skyline will join buildings around the globe for World Wildlife Fund’s annual Earth Hour by turning off non-essential lights on Saturday, March 27, at 8:30 p.m. local time. For 2010, Earth Hour Atlanta seeks metro area commitments to surpass previous participation and to make a lasting impact on energy savings. The annual global event organized by WWF is held on the last Saturday of March. Households and businesses are asked to do something quite simple—turn off lights for one hour in a call for action on climate change. The collective actions demonstrate what can be accomplished when working together to protect the planet for future generations. Earth Hour 2009 gained support from nearly one billion people in 4,100 cities in 87 countries. Energy savings affect water supply, air quality and economic development, all critical issues for Atlanta. “Our goal this year is to provide more ways for people to participate in Atlanta and learn what they can do beyond Earth Hour to make our communities more sustainable,” said Executive Director of Sustainable Atlanta Lynnette Young. Earth Hour metrics are based on commitments made at www.myearthhour.org. To list a building—business, church, school, university, government—add it after entering your name when pledging. More than 400 buildings participated in the 2009 metro Atlanta effort. "The momentum built over the last two years is certainly evident in the interest in participation we have across the City of Atlanta. We are committed to reducing our energy consumption at this hour, on this day; and throughout the year in city facilities," said Director of Sustainability, City of Atlanta Mandy Mahoney. 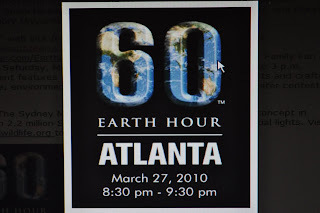 The “go-to” web site for local information on Earth Hour Atlanta is http://www.southeastgreen.com/ with updates posted at http://www.twitter.com/EarthHourATL . Activities include the Earth Hour Family Fun Festival on Saturday, March 27 at Atlantic Station from 10 a.m. to 3 p.m. Entertainment features the Seed & Feed Marching Abominable, arts and crafts, kids’ parade, environmentally conscious vendors and children’s poster contest winners. To set up an account with GREEN Express, click on this link. Green Express has expanded their pick up zone to include Mail Boxes etc., Pak Mail, Shipping Post and Soho Hero in Atlanta, Georgia. Customers can now take their packages to the shipping for package deliveries in Metro Atlanta. Green Express can also drop off packages at Mail Boxes Etc., Pak Mail, Shipping Post, Soho Hero if arrangements are made by the customer with the store. There are hundreds of shipping centers and intown business centers in Atlanta and they are a logical pick location for Green Express. For shipping out of state, use Mail Boxes etc, Pak Mail, Soho Hero Atlanta locations. Having a green courier deliver packages is an efficient way to do business and its better for the environment. 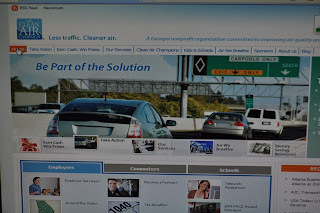 Green Express was named Innovative Company of the Year by the Clean Air Campaign of Georgia. Green Ex uses hybrid cars which use less fuel, emit less toxins. Green Express is Atlanta's Only Eco-friendly Courier. For package delivery, call 770-394-3131. Atlanta's Only Eco-friendly courier company has moved one more step forward in the social networking arena. Green Express is now on Twitter. 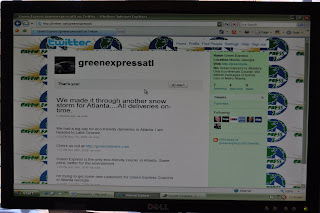 You can find Green Express by going to GreenExpressATL on the Twitter network. Part of the Green Express marketing strategy is to go where their customers are. Green Express has always had a dominant role on Google which has been a great source for new business. The green courier company expanded to Facebook over the holidays and now the Twitter move makes for a nice circle. Fans of Green Express tend to network to other green friendly businesses. Twitter and Facebook are good ways to network and meet new business prospects who believe in the same values. Green Express continues to provide same day courier service for Metro Atlanta at competitive rates while using less natural resources than their competitors. Green Express launched a new ad campaign targeting Atlanta architects, Atlanta attorneys, Atlanta medical practitioners, advertising companies and non-profits. The theme of "Going Green" is becoming more and more popular as savvy businesses are constantly finding new ways to better brand their offerings. Green Express was the first courier company in America to go with hybrid electric cars. Atlanta companies that chose Green Express like the public relations aspects of working with a company that is doing the right thing for the environment. It has become very popular under these economic conditions to use suppliers and vendors who are environmentally conscious. Atlanta Executives realize going with a green courier is good for Atlanta. If you need a quick delivery, go with GREEN Express. If you are an Atlanta architect or Atlanta attorney, please consider Going Green for Atlanta Courier deliveries. Here is the text from our recent promotion of the Clean Air Campaign. The video can be viewed by clicking on the link below. This is Jay Holgate with Green Express couriers in Atlanta and I want to put in a plug for my friends at the clean air campaign. I know these guys are working hard to improve Atlanta's air quality. We got so excited about the Clean Air Campaign that we changed our entire business model to be more earth friendly. Green Express couriers now use hybrid electric cars which emit 80% less toxins than our courier competitors. Going greener has been great for business too because we picked up hundreds of loyal customers who are committed to a better Atlanta. The Clean Air campaign pushed us to reconsider our office and the resources used in multiple people driving to work every day. The end result was we closed our office, bought laptop computers and we now have everyone working from home or mobile. 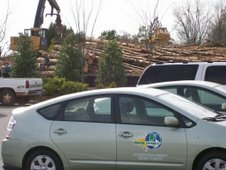 We are saving thousands of dollars in fuel per year and time driving back and forth to the office. Today, Green Express is Atlanta's Only Eco-friendly courier and we service many companies like your who want to do the best thing for our environment. For more information about our story, go to http://www.greendelivers.com/ . Green Express is welcoming any Lasership Courier Customers in Atlanta that want to switch to an eco-friendly courier company. 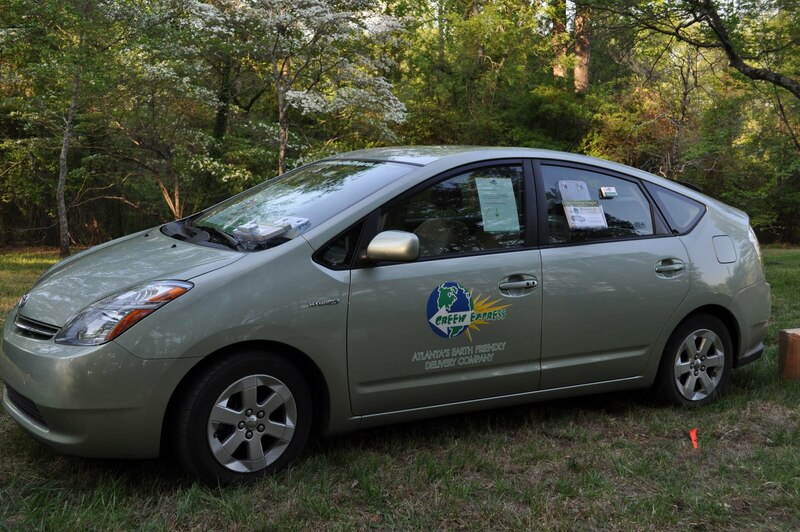 Green Express uses hybrid electric cars which use less fuel, emit less toxins which is better for Atlanta. Traditional courier vehicles emit 80% more toxins than hybrid cars. Forbes Magazine named Atlanta #1 Toxic City in the United States in November of 2009. Everybody can do their part. If we all work together, Atlanta can have cleaner air, water and be a safer place for our kids. GREEN Express was named Innovative Company of the Year by the Clean Air Campaign of Georgia. Do your part today and Go GREEN! To order package delivery from Green Express call 770-394-3131 or to set up an account, click this link. Another Green Customer. Green Express is welcoming any A Quick Delivery Courier Customers in Atlanta that want to switch to an eco-friendly courier company. 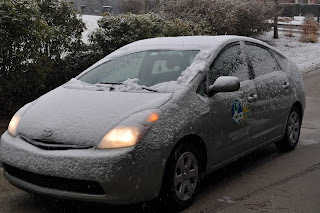 Green Express is still Atlanta's ONLY Eco-friendly courier with hybrid cars. Green Express uses hybrid electric cars which use less fuel, emit less toxins which is better for Atlanta. Traditional courier vehicles emit 80% more toxins than hybrid cars. Since we did YouTube last month, we have to keep the innovations coming. When you are the first eco-friendly courier in the country, you can't rest on just one good idea. So we set up the Facebook account and we're joining groups, making friends and all the fun things that a person does when social networking. We believe being the Only Eco-friendly courier in Atlanta means that we have to continue to come up with innovative ways to communicate to our customers and potentials clients for the future. Technology is changing our world but documents always need to be delivered across town. We hope you will GO GREENER IN 2010! Green Express is welcoming any A Quick Delivery Courier Customers in Atlanta that want to switch to an eco-friendly courier company. Forbes Magazine named Atlanta #1 Toxic City in the United States in November of 2009. Everybody can do their part. If we all work together, Atlanta can have cleaner air, water and be a safer place for our kids.